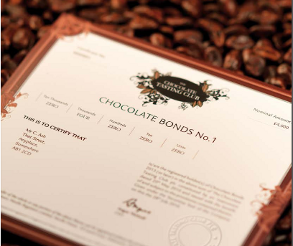 A UK chocolate atelier is cashing in on its customers’ sweet tooth by offering high-interest bonds where dividends are paid in chocolate instead of money. Thirlwell pitched the idea to the members of the company’s Chocolate Tasting Club, with positive results. “I wrote to 5000 of our club members to ask them, look, would you be interested in doing this or not? And we got a very favourable response back, along the lines of, ‘This a great example of British enterprise – we love the creativity, we love idea that the funds that you’re raising are going to be put to very good use,'” Thirlwell told Reuters in an interview. The bonds are available in amounts of £2000 or £4000, paying, respectively, gross annual dividends of 6.72% (six free tasting boxes a year, retail £107.70) and 7.29% (13 free tasting boxes a year, worth £233.35). The tasting boxes are created each month with new and experimental chocolates for members of the Chocolate Tasting Club, which are sent out to be tasted – and rated – by members. As well as giving direct feedback from loyal customers, the tasting club helps support Hotel Chocolat’s ethical cocoa policy programs, including health care, farmer education and cocoa agriculture schemes. The money raised with the bonds will also contribute to the ethical cocoa policy, by boosting the company’s St Lucia cocoa plantation to include processing equipment. In addition, Thirlwell plans to expand the company’s factory in Cambridge, open new outlets and expand the business globally.